Only MONTEBELLO combo w/ huge patio, and updated! Down-sizer? Dogs? Large family? In-law suite? Single family feel, with condo perks! This spacious 2545 SF home offers 4 bedrooms, 3 baths, both a living room and a family room, a dining room, a huge laundry/utility room, and lots of outdoor spaces ... a year-round enclosed balcony, a brick patio, and a huge open patio! Plenty of room for entertaining, relaxing or gardening in the sun. You can access a gate to the parking lot for walking the dog -- no need for the elevator! Condo includes 2 storage spaces and a garage space. The building is right next to the community center, where you can the enjoy the many amenities: indoor pool, full-service restaurant, convenience store, salon, bowling, billiard and ping pong, lounge for entertainment, etc. 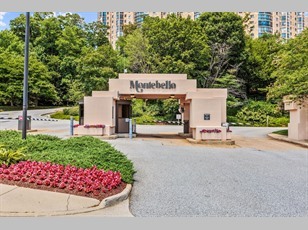 A gated community, Montebello has 37 wooded acres, 24/7 security, a free shuttle to Metro and shops, and is very pet-friendly. You will enjoy a variety of events, clubs and activities, too!